In order to support safe and focused social learning networks, iRemix has always leaned heavily towards the ‘walled garden’ approach – letting organizations have full control of exactly who has access to their community’s users and content. While we will continue to empower network owners to customize their communities as they see fit, we are implementing new features that recognize the need for user’s to connect their iRemix identities to their broader experience on the web. The ‘walled garden’ is still there but iRemix network owners are getting more control over determining how their social learning network’s walls should be permeable. 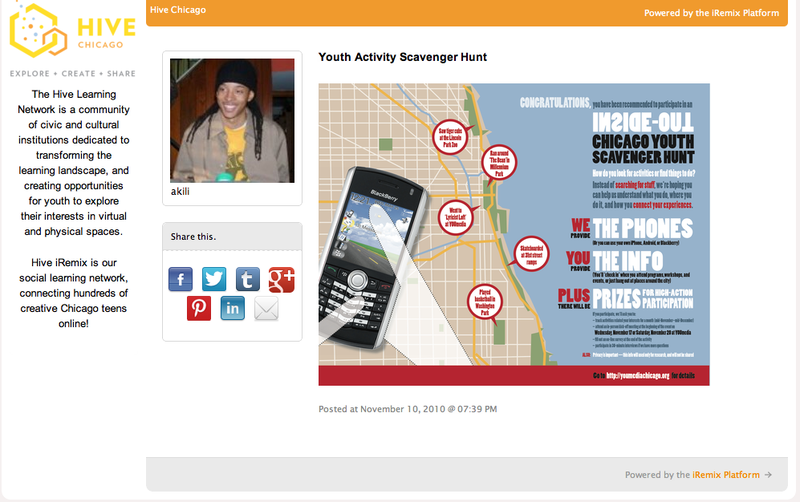 We recognize that youth have valuable experiences in many different places across the web. They have their own identity across their ecosystem of websites and online communities, serving different purposes and often with different audiences. We want to empower youth to take the powerful learning that takes place in a social learning network and connect it to their other online experiences outside of iRemix. We’re proud to announce two new features that we believe are a great step towards better situating iRemix private social learning networks within a larger connected web. Users have the option to make work in their iRemix portfolio available to be shared on the web. We’ve introduced a new sharing box to the left column on the page for all posts. This area will show the current ‘sharing status’ of the post (i.e. 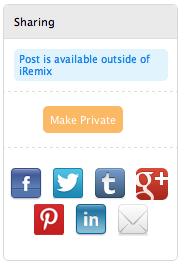 private to iRemix or available on the web), the button to make a post public or private and for public items, share buttons for popular social networks. On any original post, the user who made the post can decide press ‘Make Public’, they’ll then immediately see a confirmation screen verifying the action and once confirmed the page will update the sharing status as well as present buttons for pushing to social networks. 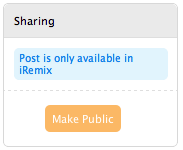 Once a post is made public, any user on that iRemix network will also have the ability to share it across the web. Once a public post is shared outside of iRemix, it lets viewers see only the content of the single post and minimal detail on the user. Following a public link to an iRemix post will not give anyone access to your iRemix network. In addition to the content of the post, the public page maintains the branding of the originating network. This provides context for public viewers around where the post originated. Sharing empowers individual users to take the best of their work and push it out to their networks across the web. iRemix does however allow network owners to decide whether or not this functionality is appropriate for their social learning network. Admins can simply update their network feature settings to toggle the ability to share on or off for any network. 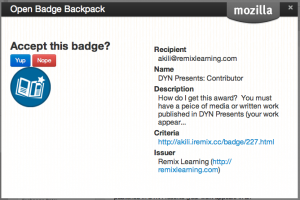 In addition to sharing out media that I’ve created, users can also now share badges that they’ve earned in iRemix. We are proud to announce iRemix’s integration with Mozilla Open Badges (http://openbadges.org). Mozilla has created a great infrastructure to support the growth of badges for learning across the web. 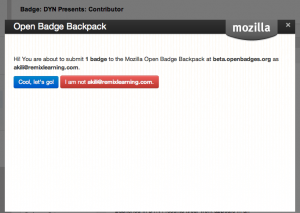 Learners can create their own Mozilla Badge Backpack and take badges they’ve earned anywhere across the web and organize and share them in a central space. For iRemix, youth (or mentors) will be able to take any badges currently in their portfolio and push them out to their Mozilla Backpack to share with the world. Its a great step to in supporting learners and organizations in ensuring learning that happens in one space can be more easily recognized and built upon in another. On the details page for an earned badge users will now see a ‘send to mozilla’ button. Clicking this will take you through Mozilla’s process for adding a badge to your backpack and wrap up with iRemix confirming the push was successful. As always, iRemix network owners have the option to toggle this feature on or off. It can be decided network by network whether mozilla badge integration should be activated. We’re looking forward to seeing iRemix’ers begin sharing their badges across the web! Announcements, Features and tagged badges, mozilla, open badges, sharing, social networks. Bookmark the permalink. Both comments and trackbacks are currently closed.